We told you about a dozen times during Prime Day earlier this month that Amazon’s massive discount on the Amazon Echo smart speaker was completely unprecedented. We also said the device might never be sold again at a discount quite that deep. The bad news, we were probably correct. But the good news is if you missed that killer Prime Day sale, Amazon has a great one-day sale happening today that’s almost as good. On Monday only, Amazon is shaving $50 off the price of its best Alexa smart speaker, making it $129.99 with free Prime shipping. 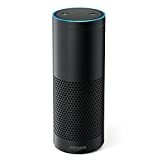 And don’t forget to check out this awesome Echo accessory, which transforms your Echo into a portable Alexa smart speaker. Of note, you can also SAVE ANOTHER $100 if you buy two Echo speakers and use the promo code ECHO2PACK at checkout. That drops the price of each speaker to just $80, which is absolutely insane.